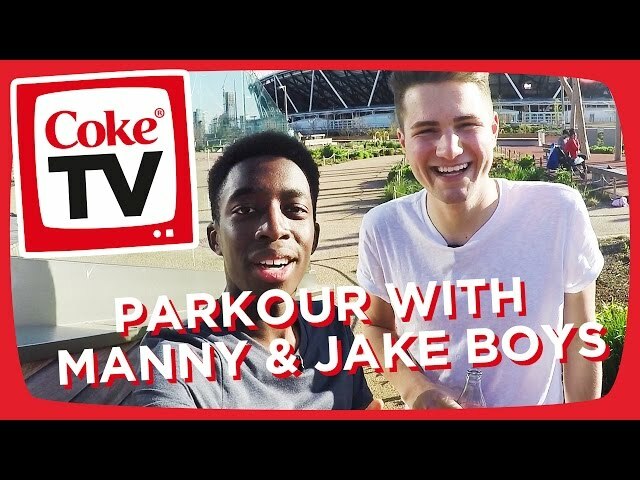 Earlier this year, vlogger Jake Boys joined Manny and Dodie as a presenter on CokeTV, our YouTube channel featuring weekly episodes with the cast. In this interview we caught up with Jake to find out more about his life behind - and in front of - the camera. It was really exciting to be on my first shoot for CokeTV. I’m working with some pretty cool people so it’s going to be good. And I found out what my first adventure will be, so that’s going to be fun! I used to do crazy videos where I’d dance around with a wig on, like a girl, and it would go viral on Facebook. Then I thought ‘actually, I want to make a proper video’, so I started making sketches and YouTube videos and it kind of just grew from there. Now I vlog daily, and it’s awesome. "I’d love to work with Adam Sandler, because he’s just my all-time favourite person in the world." So, I wake up. Let the dog out – I have a little puppy. He goes for a walk. And then I’ll film and edit. After that I’ll watch football and then go to sleep. Easy peasy. What do you enjoy most about vlogging? Probably the fact that I can create my own schedule. If I don’t want to film one day, I know the next day I can wake up a couple of hours earlier and get it done. I can kind of do what I want. You’ve already been in an earlier episode with Manny. What was that like? Yeah, the first one. Manny and I did some freestyling, and a bit of Parkour. That was crazy, I was doing a bit of jumping around, rolls and stuff. I’m so unfit as well so it was a hard work but good fun. Who would you love to work with, and why? I’d love to work with Adam Sandler, because he’s just my all-time favourite person in the world. And I think he’s absolutely hilarious. If you could do any activity for a CokeTV episode, what would it be? I would love to fly a plane, which is an idea that did come up. But definitely not skydiving. I’d happily be in a plane, just not jumping out of it. I’d walk on the wing, or stand on top of it though – just for a laugh! "I’ve done crazy stuff to keep people watching." In your words, what make a good video? I just think excitement. Get people asking ‘what’s going to happen next?’ I’ve done crazy stuff to keep people watching. I’ve died my hair AND cut it off – you’ve just got to do these things! Do you spend more time watching or making videos? Making. Because I do it as a job, watching videos isn’t really a thing I do. I’ll be honest with you, the main reason I don’t sit and watch other videos is because if I see a good idea then I’ll want to make that video myself, but I feel like that’s not really the right thing to do because it’s sort of copying; whereas I like to try and keep my ideas original. It will take me about an hour to film it, but then it will take me about seven hours to edit it. Because you’ve got to cut down everything. And I say every line 10 times, because I can’t say the easy words when I’m in front on camera! Do you have any advice for people starting their own YouTube channel? For YouTube it’s just constant upload. For example, I used to blog daily – I did about 300 days in a row – the blog started doing really well because people got really glued into my daily life. And it just shows if you stick to something and do it for a while people really will start to get involved. It’s just a matter of consistency. What are you looking forward to most with CokeTV? Getting to film the stuff which I wouldn’t be able to film myself. So all these adventures we’re going to go on. All these cool things, I wouldn’t be able to produce on my own channel, so I want the videos online so I can send them to my friends and say ‘have you seen what I did?’ I’m sure my mum will be the first person to watch them. How would you describe CokeTV in three words? Active. Energetic. And crazy. It’s just crazy fun. Read interviews with CokeTV presenters Manny and Dodie.